This program introduces the theme “blood donation” to teenagers in elementary and high-school. 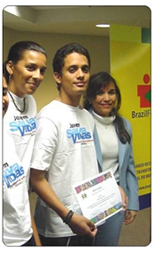 With the participation of elementary and high school teachers and students from Rio de Janeiro, since 1996 this work is developed by HEMORIO donors’ recruiters, with the participation of elementary and high school teachers and students from Rio de Janeiro. The scope of this program includes, as well, health education program for teenagers, focused in Sexually Transmitted Diseases prevention, like AIDS and hepatitis. These diseases may be harmful for them and consequently prevent them to donate blood in the future. Elementary and high school educators and students. They can disseminate this Program in their communities. Interactive presentations aimed to discuss health protection and blood donation among young people. There are two seminars per year with Hemorio’s donor recruiters, educators and students. These seminars are held in HEMORIO and include a guided visit through the institution. Call HEMORIO - 2505-0750 extension 2118 and ask for an appointment in your school.